By “Power” I do not mean force or intimidation or bullying. Power is the ability to produce the results you want and bring the people in your life along with you. A person with a dominating personality, for example, may get what he wants but he ends up ticking off the people around him. He’s not being powerful; he’s being a jerk. Jerks tend not to have deeply meaningful or fulfilled lives. Power is the essence of making your life work—it’s also the essence of leadership. Powerful people make big things happen—in their lives, in their communities, and in the world. 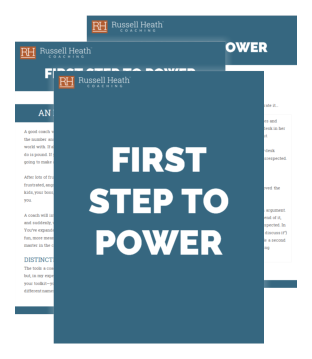 Download my “First Step to Power,” make it part of your day to day life, and let me know what’s changed. Make big things happen in your life.